B2B web video production: what does it really cost to do it yourself? Web video is a great content strategy for B2B organisations. Video is increasingly the vehicle of choice for people who are looking for information and solutions to their business problems. In fact, more and more B2B marketers are using video as a major element of their content marketing mix. For example, results from the Content Marketing Institute’s 2013 B2B Content Marketing Benchmarks, Budgets and Trends report shows that video is one of the content marketing tactics that has seen the biggest increases in adoption rates among marketers, with an adoption rate of 70%. Drill down a little deeper into, say, the manufacturing sector and online video marketing is named as their top marketing tactic, with 81% of B2B Manufacturers saying they use video, followed closely by eNewsletters and in-person events. Another interesting fact from the CMI’s report is that while the majority of marketers surveyed (54%) predict they will spend more on content marketing over the next 12 months, an increasing number say they will be bringing content creation in-house. So if you would like to join those ranks and start outsourcing content creation less, how do you go about doing that with video? 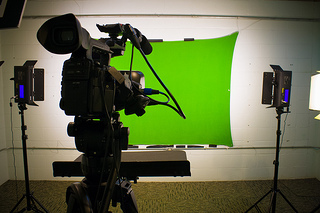 Contrary to what you might think, video isn’t hard to make nor does it have to be expensive! Steve Garfield, the very youthful grandfather of the genre has been video blogging for longer than basically anyone (he started in 2004, before even YouTube got started) and he’s tried pretty much every piece of equipment out there. His recent book Get Seen is full of great insights and candid assessments of the best types of cameras, lighting kits, microphones, tripods and software solutions for editing and distributing your video. It is a very user-friendly must read for anyone considering taking at least some aspect of web video production in-house. Advances in technology mean with a relatively small investment, you can be producing high quality videos in your own studio set-up. In reality, the studio doesn’t need to be big; it could be in a well-lit corner of an office. An easy way to start is with video blogs. This can help bring an issue or solution alive for your potential customers. After that, you might want to interview some of the people in your workforce, the experts who make your business solution so good. For both of these, all you really need is a camera, microphone, a tripod and some lights. First, the camera. As Steve Garfield is fond of saying, you probably have something you can shoot video on already. While this is most likely the case if you’ve got a digital still camera or a smart phone, if you want to create professional looking B2B videos that appeal to an executive level audience, we’d recommend going a step-up to a still affordable DSLR or traditional video camera. DSLR cameras are essentially still photography cameras that have video functionality. The main reason for their popularity has been their affordable price points (between £500 and £3000). As DSLRs have increased in popularity, more and more functions have been added, giving even more control and increasing the possibilities for filming. In particular, the camera has ‘low light’ capabilities. This allows it to capture clean video footage in situations where traditional video cameras would require additional lighting. Interestingly, the video function of DSLRs was somewhat of a novelty when it first appeared. No one could have ever imagined the Canon 5d MII would be used to create videos professionally, but it has. Notably, the series finale of the US TV series “House” was filmed entirely on a 5d Mark II , which would cost about £1200 (body only). Its brother, the Canon 550d, would cost about £500.00 The main difference between the 550d and the Canon 5d MarkII is the price. The 550d is an excellent camera. However, the 5d Mark II has better image quality and colour depth as well as a larger sensor, which gives more effects options. The key considerations for buying a camera are your budget, and what you intend to use the camera for. DSLRs have limitations to their recording time – some no more than 12 minutes of footage at a time. For businesses looking to film hour-long seminars, a traditional camera may be more suitable. A good purchase would be the Canon Legria HF G10, retailing for less than £800. It delivers good video resolution, low-light performance, a wide dynamic range and considerably longer recording times than a DLSR. Or another option is the BlackMagic Cinema Camera, a pioneering camera in terms of quality and functions, at an accessible price (less than £2000) that has been developed in direct response to rapid rise of the DSLR. Microphones are crucial for a professional-quality video. They help to concentrate the sound and eliminate external noises. We recommended lapel microphones for video blogs and interviews. They are available as wireless or wired microphones, and there is a large range in prices, which reflects quality. Rode have an excellent option at about £150. Sennhiser offer a highly professional wireless lapel with excellent sound for less than £600. While DSLRs are known for needing little additional light, if you are shooting in an indoor location a good lighting kit ensures the lighting is right for your location and your subject. Lighting kits can cost as little as £600, but for a decent size kit that provides everything you’d need for different situations, there’s the Lowel DV Creator Kit retailing which costs about £1,500. A good tripod is essential when filming regularly. You will use it more than most of your other kit and it will be supporting potentially expensive cameras, microphones and more. A fluid head will give your camera movements a smooth professional look. The Manfrotto MVT502AM is a really well priced tripod that comes with a 701HDV pro fluid head, which should cost about £250. A cheaper alternative for videos for blogs, where you don’t need to move the camera so much, is the Manfrotto MK29383 Tripod with A3RC1 head, at about £120. These are just a few of the many options out there. So, with a bit of research and a relatively small investment, you can shoot your own professional-standard web videos for anywhere from £1,500 - £5,000. The next stage is the editing. You can outsource that process if you prefer. Or, if you’re willing to invest the time to learn the basics and a bit of money on some editing software (reviews of which are also covered comprehensively in Steve Garfield’s “Get Seen”) you could be well on your way to creating, in-house and to your schedule, really remarkable web video content that helps accelerate your marketing strategy and gets you noticed. If you are looking for more information on to create your own B2B videos you may find the eBook below helpful. Alternatively, if you are producing your own videos in-house? We'd love to hear your experiences.